This car has several AC issues. First I have replaced the leaky compressor seal and upon trying to charge system I find the compressor will not engage. Fuse and relay are both good so I jumpered connection at relay and clutch engages, but I then found that the TXV is plugged (near vac on low side 100psi on hi, after 8oz charge). So signal wire from PCM is not grounding relay. Can the pressure switch on the high side (only one on this car) be bad and prevent clutch engagement at low pressures? I plan on replacing TXV and receiver /dryer. Have you tried resetting the PCM by disconnecting the battery? I think if there's a leak-out and the PCM finds the high side pressure down to zero, the compressor will be locked out until the code is reset. That's what the "important note" in the middle of the page is about. BEFORE clearing the codes, find out what they are. The 95 B and D bodies can display all codes through the climate control system, that might be possible with the F bodies too? 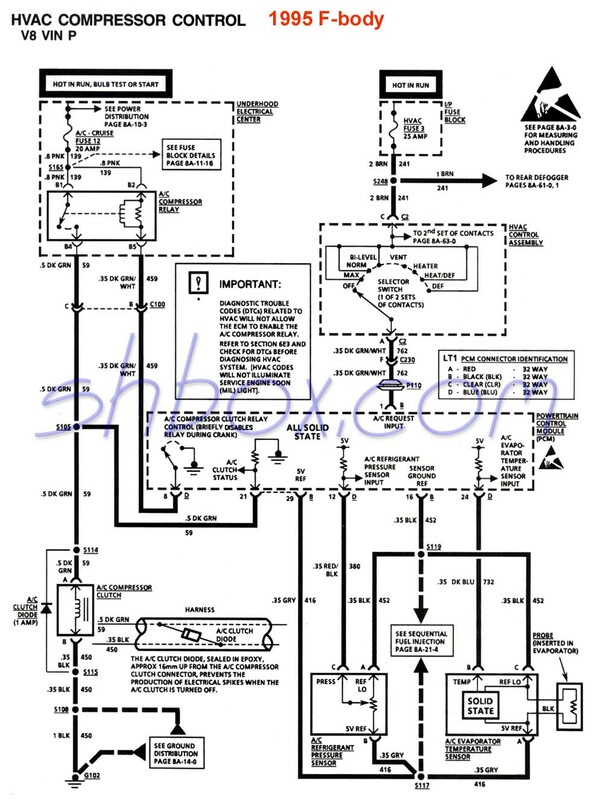 You say the system has "several AC issues" sot there is every probability there is at least one HVAC code set and, as MK378 points out, your schematic is rather clear that the PCM will not engage the compressor with current DTCs. Use the fan up/down buttons to change the display to 02, then press the "Middle" button. Any HVAC trouble codes should be displayed. You have the actual manual, so I won't bother speculating on the codes you may find. BTW: if your F body does have this feature, you can look at a lot more than just the HVAC codes. It also interacts with the Powertrain, Body, Airbag and ABS modules, so you can retrieve codes or monitor certain sensor inputs from those systems too. You can even set some things in the HVAC, like how aggressively the system heats/cools when the temperature deviates from the setpoint. Being a '95 it is a hybrid OBD car. Has ODD2 port, but OBD1 system. No ability to access codes (without going to O'reilly and using their scanner). Ive had the battery in and out several times recently doing other repairs and swapping batteries and the AC has NEVER been turned on in the past 4 months until after I replaced seal. I'll disconnect battery and see what happens. if no go then I'll try checking the codes. I think the B and D bodies have a BCM as well as a PCM. I have experienced this with Caddy, Olds and Buick digital climate controls. Back to this car today. As far as electrical problem, I couldn't get O'reilly's scanner to work, but I doubt this car will produce any AC codes anyway. Still no PCM ground at relay. I do have a 5v ref at pressure sw. I got and installed a new TXV and accumulator/dryer, got same results as far as pressure, near 0 or vac on low side, 50ish on high with 6oz charge. I might be wrong, but I don't remember low side being so low even with a small charge. evap or cond plugged??? The high side test port is post condenser just before the dryer which is just before the TXV. I guess I should have tried blowing thru/flushing evap and condenser to see if they flowed OK. I might yet have to.